As I sit in the extremely well decorated Lansing Emergency Department it gives me pause as to why I coach. Tonight, last night at this point, three of my fighters competed in amateur muay thai for the first time at the ActiveEdge Saturday Night Smoker Fights. 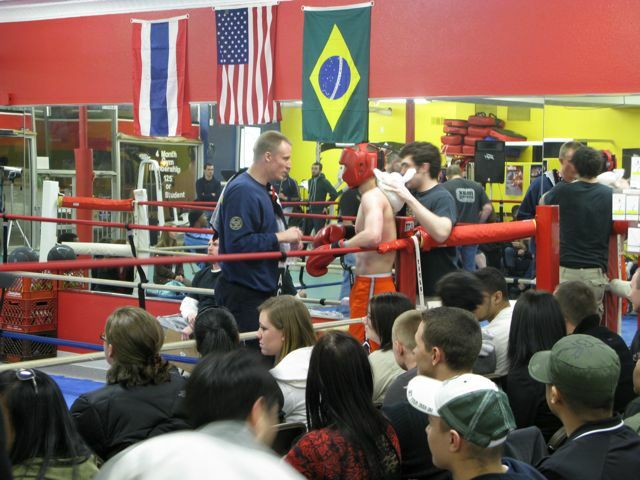 I think fighting is a valuable, life affirming experience that teaches oneself a lot about themselves and adversity. It is also fraught with physical, social, and emotional risks. You can be grievously hurt or even killed. You can lose your job and your family because you fight. Winning is addictive but the high is short lived, while losing is a bitter pill to swallow and makes you crave the highs of victory. Tonight Tom, Willy, and Chris made their debuts in the ring, albeit in a smoker that does not count for or against their record. Tom did battle with a fighter of smaller stature but reportedly greater experience. Although hesitant at first, he felt his opponent out. 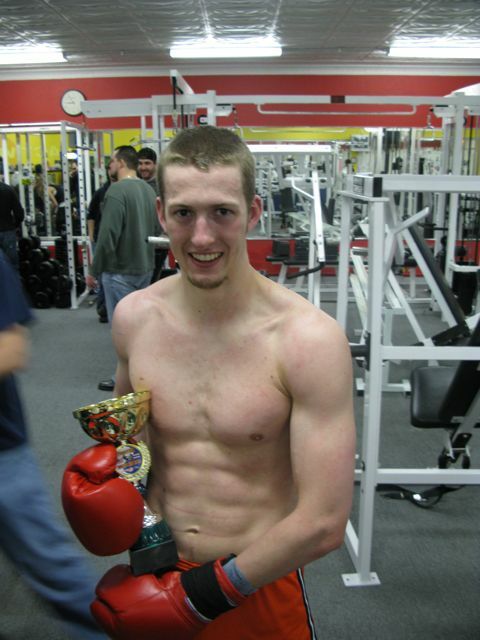 In the second and third rounds he landed devastating punch/kick combinations finishing with clinched knee work. Prior to the third round he said he was exhausted, but looking over at his opponent who had clung to him for support in the second round, I told him to do another two minutes as hard as he could. He went and did, winning a split decision. Willy also faced an opponent with greater experience, but he attacked with devastating precision landing several strike combinations. Although not usually appreciative of the clinch game he did well there too. He would often land multiple punches and kicks, then wait to see if his opponent would fall down. He seemed a bit surprised when his game enemy attempted reaction. 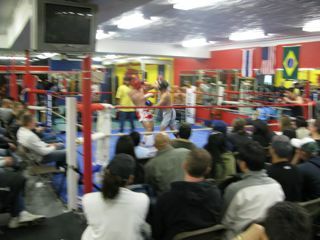 Willy earned a unanimous decision in decisive fashion. Chris' initiation to the ring was not so smooth. His opponent was a touch taller and carried a record of 2-0, he was also a heavy brawler. As Chris engaged with him he was caught repeatedly with looping lefts and rights. Refusing to quit, Chris battled on, throwing some solid shots straight down the pipe, but eventually get sucked into the all out brawl initiated by his opponent. 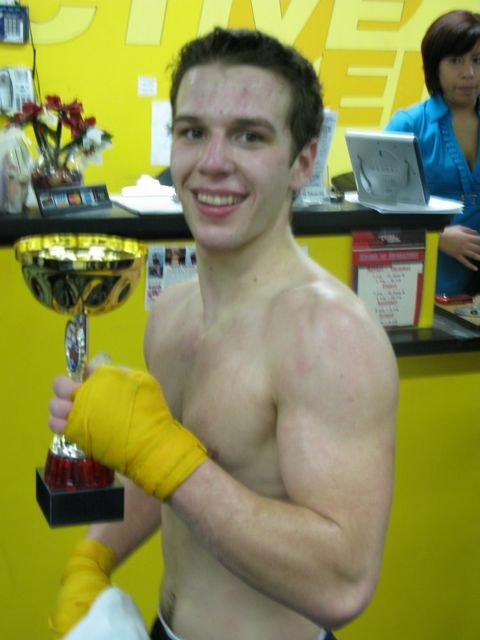 Chris lost the fight to a unanimous decision. Right after the fight he became quite nauseous and politely vomited in a trash can. Due to this and some right supraorbital pain we took him to the Lansing ED. His eye checked out, he got a CT which was read as normal (which is surprising even at baseline). With Chris' permission I am posting this tonight. Remember it is a good day when you can wipe your own @$$ and I'm glad Chris' is alright and proud of everyone's performance this evening. Who am I kidding, I love coaching, I just worry about my sociopathic children.